While the flow of refugees into the US has dramatically slowed, hundreds of thousands already here struggle to find their way in a strange land. Meanwhile, a LifeWay Research study quoted in Seeking Refuge found that just 8% of Protestant US pastors say their churches are currently involved in serving refugees locally (pg. 47). Regardless of what region or country you live in, chances are that God has brought the nations to your church’s doorstep. How can you grasp this unprecedented opportunity? I can honestly say that I didn’t see it coming. My passion for the world and my sense of all the global possibilities blinded me to the Kingdom of God potential right beneath my feet. Three years into my work as the global outreach director at North Park, it finally dawned on me that the landscape for outreach was changing and we needed deep local engagement if we wanted our overall outreach to be effective. We began receiving one refugee family per year over a period of six years and introduced an ESL program that served a growing number of immigrants. But it took the Syrian refugee crisis to push our people out of their comfort zones and into sacrificial action. As the Syrian war heated up, the Canadian government gave churches the opportunity to apply to become Sponsorship Agreement Holders (SAH). Approval meant they could directly sponsor UNHCR-cleared refugees to come to Canada. Spurred on by our government’s announcement that Canada would receive 25,000 Syrian refugees, North Park’s elders were ready to apply for SAH status but first asked me for a report on how the already-sponsored families were doing. In other words, we had to evaluate how good were we at this and whether we had the capacity to make a real contribution. The review revealed a positive impact, and we received the green light to go forward. We discovered a new “layer of disciples” in our congregation, people for whom this opportunity was just what they needed to make their faith real and to get them involved. We already had three families of Assyrian Christians in our congregation and they were in contact with other Assyrians in our city. They asked us to rescue and settle up to 200 of their relatives and friends who were in precarious situations in the Middle East. We beefed up our Refugee Settlement Committee and jumped in, most of us with little experience in working with refugees. Our government lists SAHs on its website, so when our name went up on the list, people from across our city began coming to the church daily requesting that we sponsor their relatives. Caught off guard, our church admin team became overwhelmed. Fortunately our committee members were motivated, so they worked night and day to respond to the flood of people coming our way for help. We had already completed the paperwork to sponsor 50 Assyrian refugees when we discovered that the Canadian government had basically downloaded all liability to the individual SAHs. Our insurer told us that unless we came up with appropriate protection methods, our insurance would be invalid should there be a problem. For weeks, discussion bounced back and forth until eventually we had to make the tough decision to scale back and adopt a set of protection protocols that our insurer would approve. We found Plan to Protect very helpful. We felt the pain of turning people down for sponsorship, and their anger as well. What seemed like a relatively straightforward task of settling refugees quickly became a major headache as we had to develop what felt like complicated protection protocols that not only taught people what to do and what not to do, but monitored their activities. The protocols felt restrictive, and some of our volunteers complained that they took the spontaneity and life out of their service. On the flip side, the energy surrounding our commitment stirred up our church and drew people into volunteering. Seventy signed up to serve as part of a Host Family Circle or joined our Resource Teams. We established a “Bootcamp” to train people in the protocols, then put our heads down and awaited the refugees’ arrival. We little realized how unprepared we were for the first wave of three families who landed in Canada just 45 days after we submitted the paperwork. But the excitement of it all gave our people the stamina needed to rent apartments, get people into English programs, and register children for school. 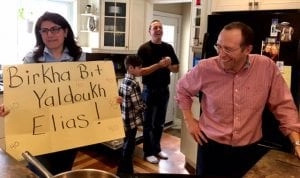 Volunteers learned some Assyrian to deepen relationships with refugees. The task was far greater than our volunteers thought they had signed up for. A few of them had the cross-cultural wisdom needed for such a sensitive moment, but many did not. What I thought might take 25% of my capacity ended up taking about 75% for nearly 18 months. Many of our volunteers tired out quickly, and some even became cynical of the workload. The remarkable part of the story is that we discovered a new “layer of disciples” in our congregation, people for whom this opportunity was just what they needed to make their faith real and to get them involved. As we watched some people step away from deep engagement, we saw new people step forward. I am proud of our leadership for seeing things this way. I doubt that such wisdom would have emerged in our church had we not been thrust into this real-life experience. World Refugee Day 2017 took on a whole new meaning when Assyrian newcomers shared their gift of dance in North Park’s services. A blessing along the way was unexpected funding that came from some American friends and enabled us to settle another 50 people (each refugee can cost about Can$8,000 to settle here), and so we launched Phase 2 last year. As we anticipate another 50 Assyrians joining us this year, our systems are stronger and a second tier of volunteers have signed up to serve. Here is a Host Family Circles To-Do List as well as a list of newcomer documents required in Canada. We reached out to three other nearby churches and are equipping them to settle some of the families we are sponsoring. All in all, we believe that this season has been historic for our church, and that it has awakened our people to the challenging work of cross-cultural mission among vulnerable people in the 21st century, whether in our own backyard or across the world. Joshua Samuels explains how they did it. Fellowship Dallas is strategically located between a very upscale part of the city and one of its most ethnically diverse, densely populated neighborhoods known as Vickery Meadow. The church had invested financially to help nearby refugees, but there were few personal relationships. Joshua Samuels was hired as a part-time community liaison to change that. The remainder of his time goes into assisting other churches that want to serve the immigrants on their doorstep. Joshua Samuels enjoys a community event with refugee children. For his first six months, Joshua concentrated on getting to know the various ethnic communities and their leaders, and the ministries already operating there. He recruited a few others from the church to form a team to learn with him. They knew it would be strategic to partner with what was already happening in the three primary groups—Burmese, Bhutanese, and Syrian refugees. 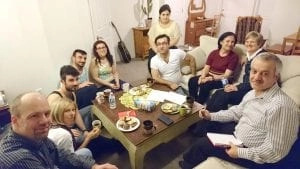 Out of that relationship-building process came the church’s Refugee Connect Initiative which nurtures friendship/mentoring relationships between church volunteers and refugee families. The initiative is built on close partnership with a small Burmese/Bhutanese congregation and a Syrian woman who knows everyone in her community. These ethnic leaders identify refugee families who are no longer getting government resettlement assistance but still need support, and who are interested in friendship with Americans. Joshua has developed a Refugee 101 course that provides cross-cultural training for all volunteers. The ethnic community leaders share cultural insights and describe what is helpful and what is not. Expectations are clearly explained—this includes making a six-month commitment to visit two- to three-times a month. When the volunteers are assigned a refugee family, they are accompanied on their first visit by one of the ethnic leaders as well as by Joshua or another church leader. Eating together is always a great relationship builder. The primary goal is to establish friendships, although there are usually practical needs volunteers can meet too—like having simple conversations that improve refugees’ English proficiency, tutoring children, explaining how to use public transportation, or assisting in the search for a better job. An important aspect is the emphasis on reciprocity. The Americans are trained to ask the refugee family what they can learn from them, shifting the mindset away from assuming the giving is all one way. It also reminds the volunteers that they need to have an attitude of humility. Some refugees are believers who have been through serious persecution for their faith, and their new American friends are challenged to consider what it means to live in a place where there’s a high price for faith. Language barriers can make developing in-depth relationships difficult. If the refugees have limited English proficiency, children in the family may translate since they learn language more quickly. Or perhaps a friend translates. Volunteers are not allowed to give out money. If they want to meet a financial need, they must do it through Fellowship Dallas which then passes the support to the ethnic church which is then the one meeting the need. But the focus is on giving time—harder for most Americans than opening their wallet. They are taught that visiting their refugee family isn’t a matter of a quick 20-minute stop but more likely two hours of relaxed interaction. That’s costly for most Americans! Joshua emphasizes that the most important key is working strategically and intentionally wherever possible with ethnic congregations or even individual believers from that community. It takes a very long time for a friendship between an American and a refugee to move to the relational level with sufficient English fluency to see them come to Christ. But Americans can quickly be a bridge to the local church or an individual believer who can share the gospel in a culturally appropriate way in refugees’ heart language. Building partnerships with small ethnic congregations has its own challenges. Joshua found that it is important to regularly affirm their partners and emphasize that the work of the pastor and other leaders is essential. Sometimes this has required that the Americans repent, apologize, and reframe their approach in order to correctly value the insight, opinions, and outreach efforts of these ethnic congregations. Joshua also emphasizes that volunteers’ service must be built on heart-felt empathy with refugee and immigrant neighbors. Setting aside political issues, American believers need to see refugees as real people. He has found that the most effective way to stimulate empathy is by sharing refugees’ stories and the realities of the situations from which they have fled. The Refugee Connect Initiative is helping Fellowship Dallas to “show hospitality to strangers” (Heb. 13:2). The result is not just helping Vickery Meadow refugees but changing the lives of the Americans who are coming to love them. Sponsor refugee children and a leader from their ethnic church to attend summer camp with your children. Churches in Tucson, AZ, work together to hold International Kids Camp designed specifically for immigrant/refugee children. Teach newcomers driving skills so they can pass the test for their driver’s license. Throw baby showers for immigrant moms-to-be who need things to welcome their new little ones. Invite immigrants to bring one of their favorite dishes while you provide the typical American Thanksgiving foods (but don’t be surprised if they prefer their own dishes!). This can also be done to celebrate other holidays. 5. World Refugee Day, June 20. Heighten your congregation’s awareness of the number and plight of refugees, especially those in your region. Encourage families in your congregation to relocate to apartments or communities with a high refugee population. Live life together. Or challenge them to intentionally apply for a job or take a work assignment in a context that employs immigrants/refugees. Ministry to refugees takes hours of time, great patience, and deep commitment. Many in this type of ministry are unheralded heroes. Thank them publicly for their work and look for ways to support them.